If the Departures magazine is just going to show up, then it’s fair game to make fun of. This time, two country ads caught our attention. The first is from South Africa and shows a group of four people greeting (or at a standoff?) 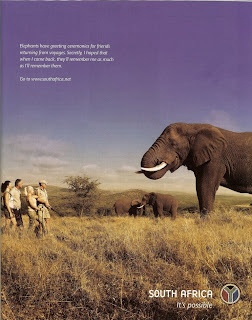 with an elephant with the text reading “Elephants have greeting ceremonies for friends returning from voyages. Secretly, I hoped that when I come back, they’ll remember me as much as I’ll remember then.” The group of four is carrying rifles. Some greeting ceremony. This ad does nothing to want to make us go. Koyaanisqatsi? 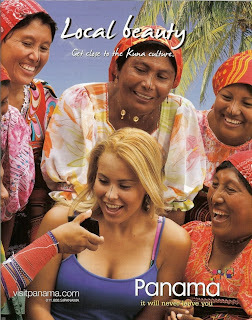 The second ad is for Panama and it shows a blonde (American?) getting a stripe painted down her nose and now she has the bragging rights of have so “done” this culture! Again, does nothing to attract us; next time just use a picture of the landscape please. remember when i used to color more make up on my magazine's cover girls? that blond can use way more african beauty make up.